I stumbled upon this blog post today as I perused through page after page of bohemian/hippie inspired blogs. I particularly enjoyed this post on the Inspire Bohemia blog, entitled, Bohemian Rhapsody Vol. 1. Below you will find the written part of the blogpost. If you would like to view the beautiful pictures (some of which I have previously grabbed from a plethora of sites and added to my own personal collection) that accompany this literary work, click on the highlighted text links. Enjoy! A bohemian (apart from technically being a native of Bohemia itself) is often used to refer to "a person, as an artist or writer, who lives and acts free of regard for conventional rules and practices." For me, Bohemian style is something defined by each individual... it's like a paint palette on which an artist blends his colors, over time it becomes layered with the colors from all of his masterpieces, the evidence of his passion and labor. For me, my style is just the same, evidence and expression of my travels, my passions, my creativity and the essence of my personality. 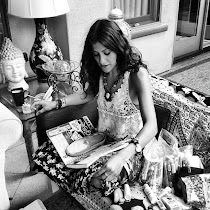 Both in fashion and design, I am a whirlwind of bohemianism - a collage of all the things I love, uninhibited by convention. Bohemian style is articulated over time, it's a passionate collection of global beauty unregulated by trends or pretentious order, it is a reflection of ones personality and above all it makes for a warm and cozy sanctuary from the daily grind! There's no style I love more than an eclectic and artistic amalgamation of furniture, art and accessories! Even if a bohemian isn't your cup of tea, you can still apply it to your own style by remembering to follow your own inspirations and ideas of beauty and not let trends and opinions effect the expression of who you are and what makes you happy! Amen! And now, enjoy the first volume of what I consider to be some amazing bohemian themed inspiration photos........ oh, and have a wonderful weekend!